The Giant Desert Centipede is quite attractive, but it has a very unattractive bite! The Giant Desert Centipede Scolopendra heros is a large species of centipede found in North America. They average about 6.5 inches in length, but can reach up to 8". They are very colorful and many keepers believe they are one of the most beautiful of the centipede species. They are the prize of many collectors and make a wonderful showpiece in a display. The Giant Desert Centipedes are hardy and easy to keep. This is a relatively calm species of centipede and its venom is not considered deadly. It is handled by experienced keepers, but it can give a very painful bite. We do not recommend handling any centipedes. Caution: The bite of all large centipedes are potentially medically serious, especially so to small children. The Giant Desert Centipede Scolopendra heros was first described by Girard in 1853. The Giant Desert Centipede is found in the southern United States and in northern Mexico. Other common names this centipede is known by are Giant Sonoran Centipede and Giant North American Centipede. These are terrestrial invertebrates that live under stones and wood, in crevices, and in litter and soil. They will burrow some, staying underground on warm days and emerging in cloudy weather. They are carnivorous and feed on insects, lizards, frogs, and rodents in the wild..
Three subspecies were named by G. Attems in 1931. They are the Giant Red-headed Centipede Scolopendra h. castaneiceps , Giant Black-tailed Centipede, Blue-tailed Centipede Scolopendra h. heros , and the Giant Arizona Desert Centipede, Giant Black-headed Centipede Scolopendra h. arizonensis . 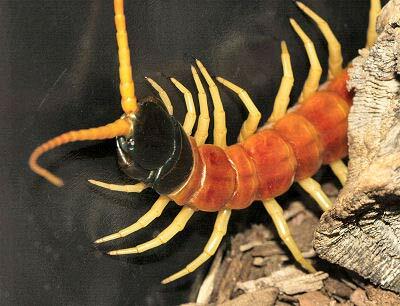 The Scolopendra heros is not on the IUCN Red List for Endangered Species. This is a red or dark orange centipede with yellow legs and a black head and tail. It is found in Arizona and Mexico. Some of the Arizona specimens have black bands running across the tergites, parallel to the legs. This is a yellow centipede with light yellow legs and a medium to dark blue tail. It is found in New Mexico, east to Texas and northern Mexico. This is a jet black centipede with a red head and yellow legs. It is found in New Mexico across the southwestern United States and as far north as Kansas and east to Georgia..
Small juveniles will eat pinhead crickets or other small insects. As adults they will feed on prey that is not larger than themselves, including large crickets, cockroaches, and even pinky or fuzzy mice. It is generally suggested however, that you don't feed prey that is more than half the length of the centipede. Feed crickets and roaches once a week. Once a month feed a small pink mouse. Keep in mind that overfed invertebrates, and especially overfed centipedes, seem to die much sooner than those that are kept "lean and mean". A large enclosure that offers plenty of floor space and a deep (4"+) substrate of damp sand and peat moss is ideal. This species will spend most of its time buried in the substrate with only the tips of the back legs or its antennae above ground. Also offer a few well-placed pieces of cork bark, bark, or a sturdy slate shelter to keep specimens settled. A good habit to get into is cleaning up any uneaten prey items the day after feeding your centipede as decaying organic matter commonly attracts mites, fungus, mold and other potentially harmful organisms into the enclosure. If your pet has recently molted, remove uneaten prey items immediately. Newly molted centipedes are vulnerable until their exoskeletons hardens. When first introduce to its new enclosure, the centipede will often explore the entire area. But once settled in, it will spend most of its time buried in the substrate. All you will see are the tips of the back legs or its antennae above ground. Though they remain hidden by day, the enclosure can be fitted with a red or blue bulb to be turned on at night to watch the centipede foraging for prey and exploring its surrounding. We do not recommend handling any centipedes. Despite photos of "daredevils" handling large specimens, all Scolopendra are capable of delivering a very painful venomous "pinch". Large specimens should be considered medically serious and some people with reactions to insect venom and those with small children should be very cautious when keeping large Scolopendra species. There is no copulation for centipedes to reproduce. Rather centipede males deposit a spermatophore for the female to find and take up, which then fertilizes the eggs. For species In temperate areas eggs are laid in the spring and summer, but in subtropical and tropical areas they seem to be laid most anytime of year. Giant Desert Centipedes have relatively few common health issues as long as they are fed properly, housed in an escape proof enclosure with proper humidity levels, and the cage is kept free of decaying organic matter. Centipedes will feed on a variety of prey including grasshoppers, moths, worms, and even small vertebrate prey, but be cautious of any prey that is captured in nature as they may be carriers of internal parasites. Keep in mind that overfed invertebrates, and especially overfed centipedes, seem to die much sooner than those that are kept "lean and mean". Newly molted centipedes are vulnerable until its exoskeleton hardens, so should have uneaten prey removed immediately. The Giant Desert Centipede is commonly available in the spring and summer from invertebrate collectors in the Southwestern United States. From these collectors they get spread to dealers throughout the country and they are usually inexpensive. They are hardy and easy to keep and will no doubt be captive-bred in the future. Looking to buy GDC M and F, will pay $30 for both specimens. BUY FROM TRUSTED SUPPLIERS ONLY. We can arrange transportation for out of state homes! There are a few color patterns worth a bit more. If you live around Medicine Lodge in Kansas, please contact me if you can find them, we can work something out. Also, I would be able to get a bit more for the red and black stripe form from Southeast corner of AZ, Northwest corner of NM. These are only found in the Peloncillo mountains and the Pedregosa mountains that I'm aware of. You can contact me for more information, but keep in mind, that you aren't going to get rich collecting centipedes! We just found one that is 8 inches with black head and tail. Do you know where we can take it to in Tucson, AZ?